For my husband and me, our biggest interest in the quilt show wasn’t necessarily the quilts, but rather the exhibitors. We have our first “vendor experience” as Quilted Twins on Nov. 9 and 10 sponsored by the Country Road Quilters of Ocala. We would like to go prepared for having the best time of our short quilt fabric selling lives! These guys won our imaginary award for the most interesting ribbon we saw! I have no idea what company this was, but we loved their ribbon! We walked in and I was drawn in by the really interested staff at The Modern Sewist. They had a beautifully decorated setup, as well as staff that seemed helpful, friendly and willing to go out of their way to deal with whatever problem might arise! So, in my head, I gave them the award for the most interested and helpful “stuff” booth. They seemed truly helpful and willing to answer any questions that the customers had. 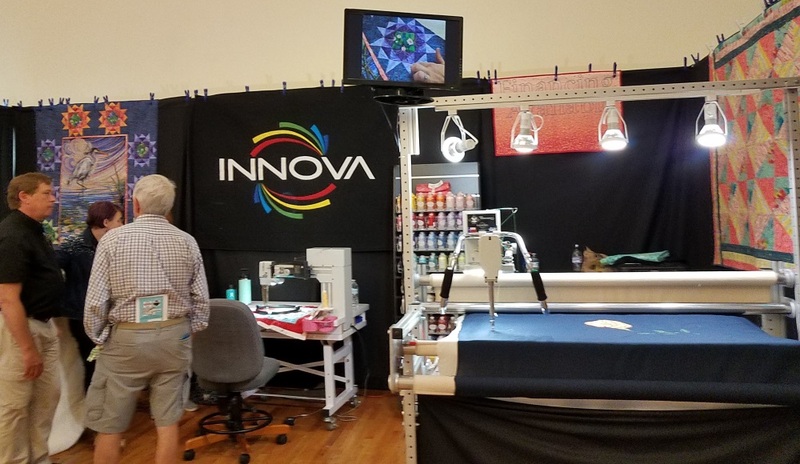 And then, we came to the Innova booth! We watched with interest, and then we were approached by a salesman, inviting me to try the longarm there. I mean, honestly, wouldn’t you try one if you could? I had never handled one at all. It was fun and easy! So, I marked them off as the most FUN booth out there! 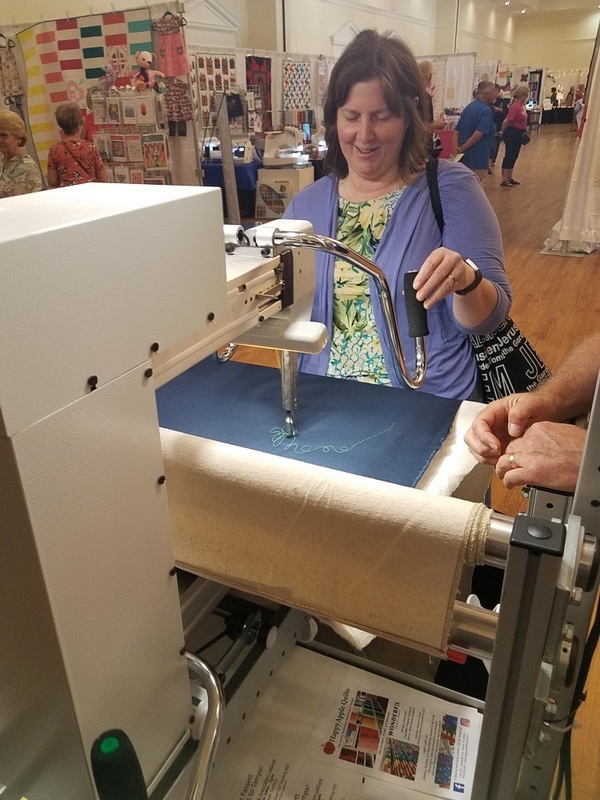 While I was playing on the longarm, my husband was checking out the other one, also being demonstrated by another staff member. And then.. drum roll.. We came upon the FABRIC!!! It was like a mini store right at the Conference center! We are incredibly spoiled at our $4.99 per yard for the same beautiful Benartex, Andover and Kanvas prints, that I wasn’t too keen on actually buying anything here. I was more interested in seeing how they had their setup going. However, this is far too much weight for my sore, tired arm (that’s another story for another day). So, we kept on moving! But, you’ve got to admit, that it’s fun to look at. It’s the $11.25 per yard that I didn’t want to swing! I mean, who wouldn’t give them the award for the “hardest and heaviest” booth to set up since they brought half of a store’s worth of fabric on bolts, and we all know how heavy those are! My own award for the most intriguing item for sale went to this wonderful setup of feed sack fabrics! This lady’s entire store was comprised of genuine feed sack cloth and clothes made from them as well as other super old quilts and items. Her space was already too full for me to get to look at much, however. I wanted to come back, but forgot! Oops. Kudos went to Your Sewing Place for a sign that made it impossible for you NOT to know what company they were. As well, their layout seemed to attract customers and they stayed busy the entire time I was there helping people into their setup. I didn’t venture in, because I didn’t need anything, other than ideas! So, I gave them the “Best Signage” award. But I felt like I hit the jackpot when my husband told me there was a discount table near the lobby entrance! It was loaded high with more books and magazines than I could ever look at! It seemed to be sponsored by the Piecemakers Guild, and I enjoyed leaving my money with them, to help them as they had really put on a spectacular show. They won the “Best Price” and “Most like a Treasure Hunt” award! So, if you get a chance to go to a quilt show, please do. Plan now to come and see us at the Circle Square Cultural Center in Ocala on Nov. 9 and 10! “Do you want to go to the quilt show?” queried my husband.